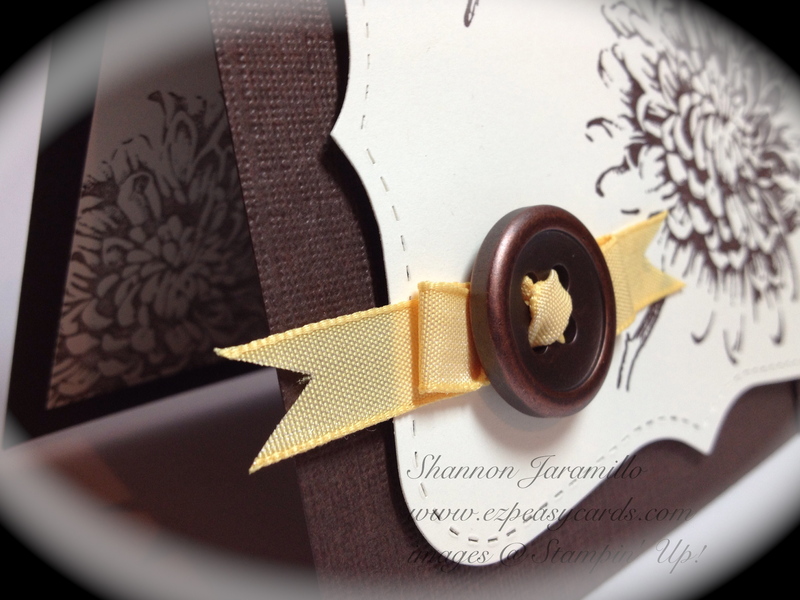 Today I am sharing a card I made following the sketch provided over at Freshly Made Sketches, created by Leslie. I enjoy participating in challenges as I think they give me options that I would not have thought about on my own. When I saw today's sketch, I knew immediately that I would use a new stamp set called Blooming with Kindness. I see great versatility in the simplicity of the flower and the wide variety of phrases available in this stamp set. I believe it will get lots of use, always something I consider when choosing a stamp! I followed the sketch quite closely today, however I did alter the placement of the sentiment as the set I chose to use did not have a sentiment that matched the sketch. And that's okay, because the sketch is really just an idea, we are always free to make adjustments to suit our needs! In place of the seniment banner, I used a Brushed Bronze Designer Button, now available in the Holiday Catalog. I was surprised when I picked one of these buttons up, they are much lighter weight than you would expect and the extra large holes in the center allowed me to pull my ribbon through easily. The card is monocromatic so I used a bit of 3/8" taffeta ribbon in So Safron to add a pop of color :) I just threaded the ribbon through the button, folded it back onto itself and snipped banners into the ends. I did want to point out that the Designer Series Paper is from the Candlelight Christmas Designer Series Paper set available in the Holiday Catalog. Yes, you read that right, Christmas paper. I just love the thought that goes into the creation of Stampin' Up! 's designer papers. They have longevity built into them!